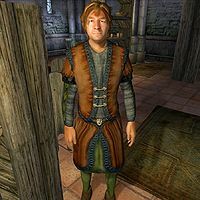 Damian Magius is a Breton commoner employed as the Warehouse watchman by the Imperial Trading Company in the Imperial City's Waterfront District. He is stationed in the Company Office next to the Warehouse and sleeps upstairs in the private quarters every night between 10pm and 6am. After waking up, he heads downstairs and spends the first three hours of the day working on the ground floor. At 9am, he heads down to the Warehouse and unlocks the two doors, giving the employees access to their workplace. After that, he returns to the office and spends the rest of the morning inside. At noon, he walks down the dockside and enters The Bloated Float Inn for a two-hour lunch. At 2pm, he returns to the office building for some more work. At 6pm, he once again heads down to the Warehouse and locks up for the night. When he returns to the office building, he heads upstairs and eats a two-hour dinner. After a bit of relaxation, he jumps into bed at 10pm. On Loredas and Sundas, he skips his lunch at the Bloated Float and stays inside the office. He wields a steel mace and wears a set of common middle-class attire, a russet felt outfit with pigskin shoes. He carries around a spare pair of burgundy linens, the office key, the warehouse key, and a small amount of gold. He is a man of few words and will introduce himself like this: "I'm the warehouse watchman, Damian Magius." When asked about the city, he will be a bit more talkative and will tell you about the whole trading business going on at the dockside: "We store goods here until the buyer can collect them, or until the ships come in." Both the mace and the warehouse key that he carries respawn endlessly if they are taken from him. This page was last modified on 16 August 2018, at 10:55.